This 2006 BMW 550i with 6 SPEED stick shift manual transmission is offered to you for sale by Okaz Motors. This 2006 BMW 550i comes with a CARFAX Buyback Guarantee, which means you can buy with certainty. Today's luxury vehicle is not just about opulence. It's about a perfect balance of performance, comfort and attention to detail. This 2006 BMW 550i is the perfect example of the modern luxury. 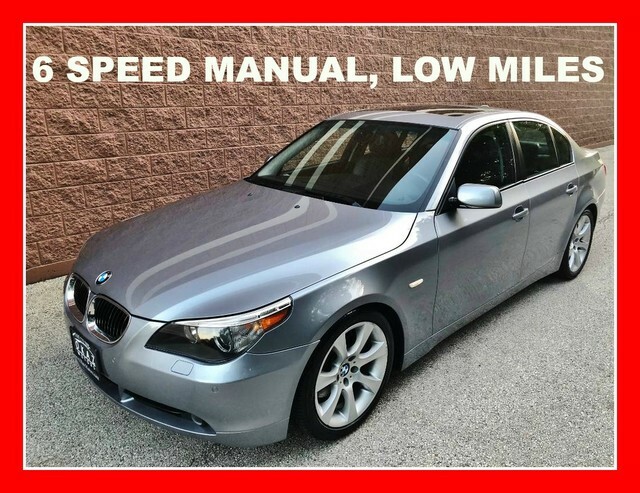 This 2006 BMW 550i has such low mileage it has been parked more than driven. Added comfort with contemporary style is the leather interior to heighten the quality and craftsmanship for the BMW 550i The easiest choice in purchasing a new vehicle is choosing one with a complete and detailed history like this gently driven pre-owned vehicle. This BMW 550i 6 SPEED is in great condition both inside and out. No abnormal wear and tear. High performance is what this vehicle is all about. You will be reminded of that every time you drive it. Treat yourself to a BMW 550i that's got it all. Nearly every option is packed into this beautiful ride.